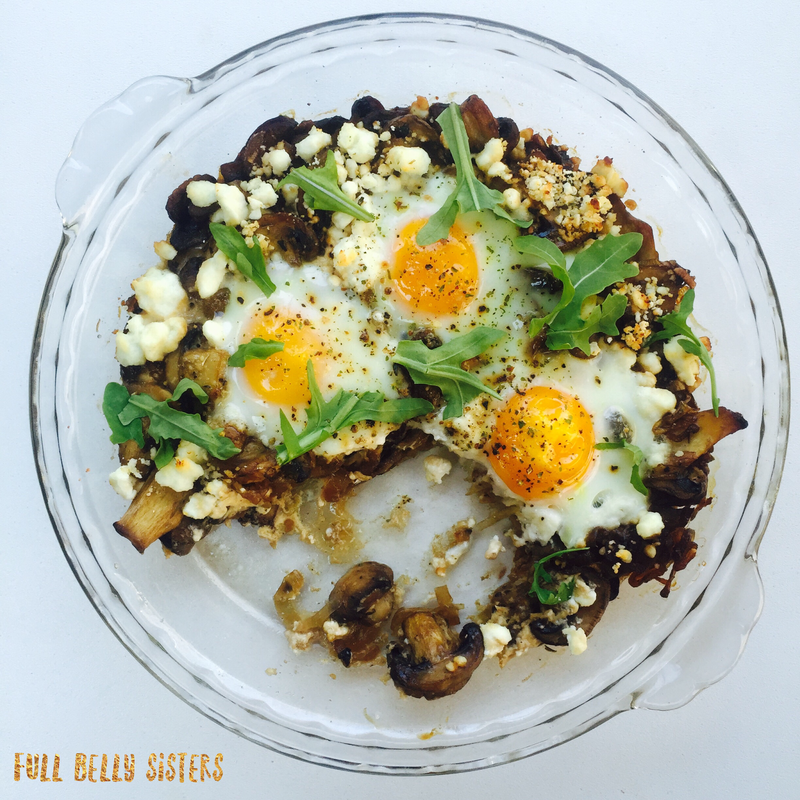 This rustic Mushroom Goat Cheese Baked Eggs is simple but incredibly delicious. Stunning enough for brunch, hearty enough for a Meatless Monday meal, healthy enough for a post-workout lunch—it's yummy any time of day! Each time I participate in Freaky Friday, I have so much fun. In case you don't remember from my previous #FreakyFriday posts, this event is a "blog hop," in which a bunch of food bloggers are assigned to another's blog; we choose a recipe, recreate it, and share it on our own blog. Best of all, it's a secret, so we don't know who is assigned to each blog! I can't wait to find out who is making a Full Belly Sisters recipe this time around. And special thanks to Michaela, from the wonderful An Affair from the Heart, who organizes this fun foodie event. I was lucky enough to be assigned to the fantastic A Kitchen Hoor's Adventure (um, is that the best food blog name EVER?!). Christie, the brain and palate behind the blog, loves healthy recipes that are simple and tasty. A girl after my own heart, that's for sure. Special bonus: Christie made her version of my Cannoli Ice Cream recipe for a previous Freaky Friday—so now it was my turn to make one of her recipes! There were lots of recipes that were calling my name: the BBQ Pot Roast Sandwiches with Garlic Radish Slaw is a drool-worthy comfort food meal. And these divine Blue Cheese, Fig, and Caramelized Onion Palmiers combine some of my very favorite ingredients into one amazing appetizer. But it was the Mushroom Cheddar Baked Eggs that truly called my name. I am am absolute mushroom and onion FIEND. When I was little and first learned to cook, I would come home from school every afternoon and I'd sauté mushrooms and onions and eat them on buttered toast. I was a weird kid, what can I say? Christie's recipe brought out the weird kid inside of me; I just had to make my own version of her dish. I made some changes—like swapping goat cheese for cheddar—but the spirit of the dish is the same: rustic, yummy, simple, and hearty! You can make the mushroom/shallot mixture a day ahead and then just crack the eggs into it right before baking. Preheat oven to 350 degrees. Place a large skillet over medium heat; add two teaspoons of ghee or butter and let it melt. Sauté the shallots until they begin to lightly caramelize. Stir in the mushrooms, as well as some salt and pepper, and sauté until the mushrooms release their juices and turn golden brown. Place a teaspoon of ghee in a pie plate or casserole dish; heat in the oven for about two minutes, or until the ghee is softened. Using a pastry brush, spread the melted ghee all around the inside of the baking dish. Add the mushroom and shallot mixture, then top with the crumbled goat cheese. Using the back of a spoon, make four indentations in the mushroom mixture. Carefully crack an egg into each indentation. Top with salt, pepper, and herbes de Provence. Bake for 18 to 23 minutes or until desired doneness. The whites should be cooked through but the yolks still soft. While the eggs are baking, toast the bread. Gently rub the toast with the cut side of the garlic clove until the bread is fragrant. Remove the eggs from the oven. Top with fresh herbs or greens (I used baby arugula, but chopped chives would be fabulous, too) and serve with toast. Oh I am loving the sound of this for a special weekend breakfast or a brunch! Cant wait to make this! The family is going to love it! Stunning photos, Justine! I love every single flavor in this dish!! I can't wait to take it for a test drive! Thanks for being a part of our group! Love having you here! This looks awesome! Totally my kind of breakfast - yummy, filled with veggies, and full of flavor! Good lord this is stunning! Great choice for a recipe! Thank you for all the kind words! This is one of my favorite recipes! Perfect for breakfast, brunch, dinner, any time!! I love that you added goat cheese. Yum! This sounds so good! My chickens are laying so many eggs right now, I have been looking for new egg recipes to experiment with.... Thank you! Perfect breakfast for the weekend and love that everyone gets the same warm meal right out of the oven! This looks and sounds absolutely wonderful! Yum! Oh yum! I bet these baked eggs would go down a real treat next weekend for brunch :) What a great idea combining eggs and goats cheese! LOL...I STILL saute mushrooms as a treat sometimes. I was like you when I was a kid. And I love goat cheese too...this looks like the perfect breakfast (or lunch or dinner!) to me! Wow Justine, this looks amazing! Mushrooms, eggs, goat cheese...yum, yum, yum! This sounds soooooo yummy! My hubby and I have become obsessed with goat cheese since visiting a goat dairy farm in December! I will have to try this! Great dish! So versatile too, great for breakfast, lunch, brunch! Wow! This food looks great! I like it. I will do it on weekend. :) thanks!